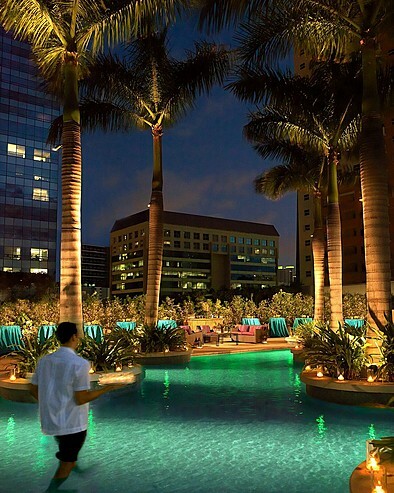 The name Four Seasons immediately conjures up images of a luxurious hotel filled with beautiful, well-to-do people, and the five-star Brickell Avenue Four Seasons does not disappoint. If anything, it exceeds those expectations with a fabulous location in the heart of everything that is pulsating in Miami, but offers the best of quiet serenity, too, making it the perfect place to stay for relaxing AND living it up. Of course, in a subtropical climate like sunny South Florida, the pools (yes, there are two) are one of the main attractions. They are surrounded by gorgeous private cabanas for stylish and comfortable relaxation, and the hotel’s spa offers treatments in those cabanas as well as in-room service. The guestrooms are luxuriously designed and feature city and bayviews, so the balconies are the perfect spot to begin or end the day. If splurging is an option, take it to the top and stay in the Presidential Suite, complete with dining and living rooms, impressive bayviews, a large soaking tub and oversized separate shower in the master bedrooms, and comfy lounging chairs throughout. If you find the urge to get out of the hotel (although we don’t blame you if you don’t! ), it’s easy to hit up one of Brickell’s many nearby hotspots for some dancing and cocktails to top off the night.